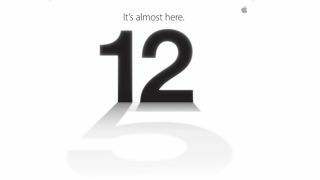 The shadow for the "12" looks conspicuously like a "5"
A FedEx insider released an internal memo that provides yet another hint of a Sept. 21 new iPhone 5 release date. The memo describes a "surge volume" that will take place Sept. 21-24, exactly when the new iPhone 5 release is rumored to be taking place. The FedEx communiqué instructs employees that training classes previously scheduled during the period starting Sept. 21 have been postponed to November, just as similar internal communications from Verizon and AT&T recently forbade employees from taking holidays during that week. The ban on vacations and postponement of scheduled activities could indicate these companies are expecting to move high product volumes during that time. All in all, a Sept. 21 iPhone 5 release date is looking more and more likely. The Sept. 21 iPhone 5 release date was initially rumored back in July, when the Apple event taking place on Sept. 12 first came to light. That event has since been confirmed by Apple - the Cupertino tech giant sent out an invite recently with the words "It's almost here. 12." The shadow for that "12" looks conspicuously like a big "5," removing any room for doubt as to what's being announced at the Sept. 12 event. Another site, GottaBeMobile, claimed on Friday that "a trusted source" has also confirmed the Sept. 21 iPhone 5 release date. iPhone 5 rumors have been flying for months, with the latest claiming that the new iPhone won't be the only new Apple product in the spotlight on Sept. 12. In fact, two or three new iPods could be introduced alongside the iPhone 5. Other recent rumors indicate that the iPhone 5 will have a larger, 16x9 4-inch screen and a bigger battery to compensate for it. No matter what, there're only five days left to take in all these iPhone 5 rumors, so enjoy it while it lasts.